There are so many indie brands that sometimes thinking about the possibilities makes my head spin. Truth is I have featured very few indie polishes here but that's about to change. It's just something I cannot ignore anymore as I know that many of you,love them and would want to see them swatched. 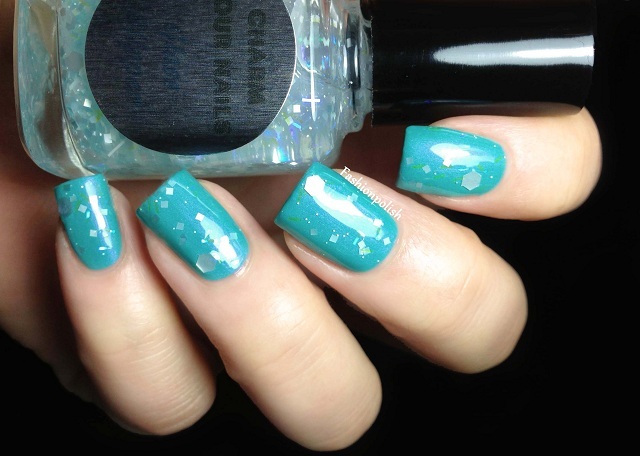 Today, I have a gorgeous topper from a new (to me) brand called Charm Your Nails created by the wonderful Lindsay. Glass Slipper is a delicate blend of pearly white glitter in various shapes and sizes along with small bar blue iridescent shards in a sheer baby blue base. I really love how elegant it looks and that it offers so many layering possibilities thanks to its subdued color range. Formula was really nice, not to thick and apart from the inevitable "fishing" for larger glitters, it applied effortlessly. This is one coat of Glass Slipper over 2 coats of Rescue Beauty Lounge Aqua Lily and topcoat. 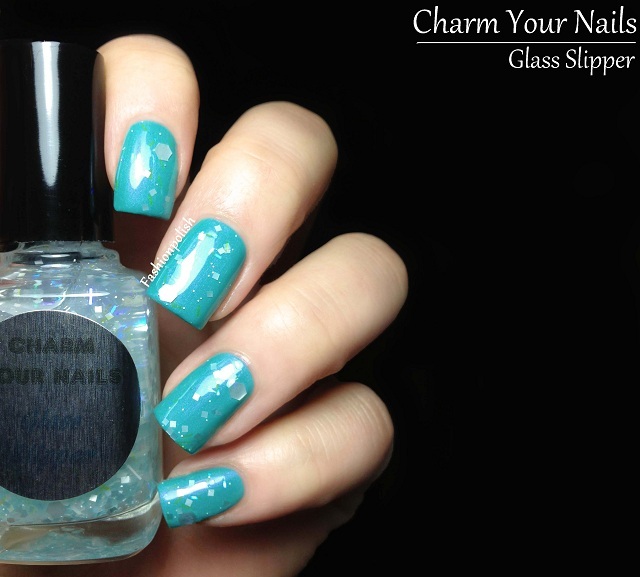 Glass Slipper can be purchased from Charm Your Nails Etsy Shop and retails for $8.50 (0.5 oz) or $3.50 (0.125 oz). Don't forget to enter the "CHARMED" discount code during check out to get 10¨% off your entire first order! I also have Charm Your Nails Spiders in the Candy Corn, Instant Gratification and Mal-eficient's Magic to share with you very soon so please don't hesitate to visit Lindsay's store and tell me in the comments which one you'd like to see next! Oh, so pretty! That combination is fantastic! Waaawww... Awesome, especially over this blue ! Thats so pretty I love polishes like this! Wow, very pretty! Not to sound terribly creepy, but your nails are just about the most perfect thing I've ever seen! Can I see Malificent´s Magic on your nails next? Since your taking requests LOL. It seems like a very compicated blend, ´dark purple and green glitters mixed with various sized black glitter in a glowing green flame base´? Can´t wait to see what base you come up with, you always make the mose amazing combo´s. Love the way you paired this! I second the request for Mal-eficient's Magic next please!